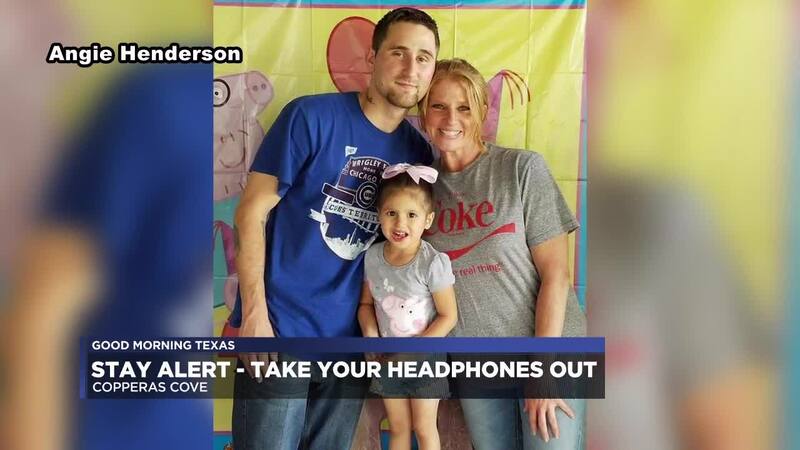 COPPERAS COVE, TX — A mourning mother is asking everyone to pay attention to their surroundings when wearing noise-canceling headphones after her son, Kurtis Roemling, was hit and killed by an oncoming train in Copperas Cove last month. Roemling was on his way back to his way back from a 7-Eleven, a place he vised frequently. Except this time as he walked, he took a shortcut through the train tracks. His mom Angie Henderson is still in disbelief. "It's shocking because being 29 and where he was walking, you just think he would be a little more aware. It just goes to show you how tuned out he was," Henderson said. As the train was approaching him, the conductor took all measures to get his attention. Since his music was too loud he couldn't hear what was quickly approaching him. "They zone out almost because they're always in the moment of what's in there ears," Henderson said. Not realizing how dangerous headphones could be, she is advocating for others to pay attention to the world around them by having at least one headphone out. She realizes that others are unaware the dangers noise-canceling headphones can be and she hopes to open their eyes. "I was walking out of the gym and saw a young man getting into his car with them in," Henderson said. "I ran up to him, told him my story and he thanked me and said he would keep that one headphone out." Looking back Henderson realizes how much her son wore his headphones. "He'd be in his room with them on, he'd be out walking with them on. So he did, he wore them a lot," Henderson said. The city of Copperas Cove expresses caution to everyone about the dangers of walking on train tracks. Some not realizing it is actually illegal to. "Our school recourse officers stop children all the time trying to cross the tracks to get to school so its that stop out and talk to them and inform them that its against the law and the dangers and the hazards of it." Kevin Miller said, the City of Copperas Cove Public Information officer. Along with Henderson, an organization called One Ear Out is advocating for this same issue. The founder of One Ear Out, Mark Neitro, also lost his stepdaughter Amanda due to that same reason. He says that he couldn't believe how many people he has met who have suffered the same type of loss. According to One Ear Out, there have been 60 deaths from train accidents due to people wearing headphones. The organization hopes by spreading the word more people will start using their headphones with one ear out and stay off train tracks. Through telling their stories, Henderson and Neitro hope to open everyone's eyes before its too late. One Ear Out has partnered with Aftershokz the alternative to noise canceling headphones. They're headphones that rest on your cheekbones leaving your ears uncovered and canals unblocked. "People just aren't aware, until something really bad happens and it opens your eyes but if I can open their eyes before something bad happens that's my goal," Henderson said. For more information on One Ear Out and their mission visit their website.